Quick note- you might notice things look a bit different around here. I installed a new template! I'd love to hear your thoughts about it, or any problems that you're having. I'm trying to make sure everything still works, so it would be great if you let me know if anything is wonky. Thanks!! Last month, I told you all about my monthly goals and today I'll be sharing how I did, as well as let you know my goals for April! I mentioned it before, but I love setting monthly goals. At the beginning of the year, I set some pretty big resolutions for myself, and having monthly check-ins really helps me stay accountable and on track. Let's get to it. In the comments, let me know what your goals for the month are! -Run 100 miles . No. I probably should have checked my training schedule for the month, because even though I followed my plan to a T, I was still below my goal of 100 miles (I ran a total of 78 miles). 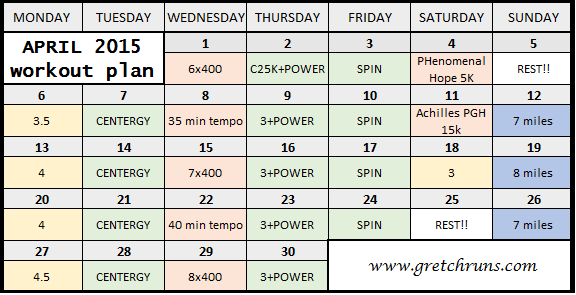 -Take a Centergy, Power and spin class each week . Yes(ish). I technically missed one spinning class because I spent too much time walking dogs at the Humane Society and had to run home, but besides that I hit my goal. I consider this one a success because I had to re-arrange my schedule and went to some 6AM classes before work. I'm proud of myself for not using my schedule as an excuse to miss, so I consider this goal a success! Check out my reviews of Centergy and Power here and here. -Follow my training plan 100%. Yes (minus the one spin class). I completed every single workout and even ran with Dan 2-3 times a week! I also hit all of my goal paces (surpassing them in fact) for my speed workouts, so I consider this one complete. -Read a book. Yes! This month I read My Sister's Grave by Robert Dugoni. It was a great, suspenseful book. If you're looking for an easy read with a great ending, check this out. -Cook a different cuisine. Yes - you can check out what I made here. -Drink water! Yes. I didn't track my water, but I made sure to drink a glass every day as soon as I woke up and when I got home from work. I also drank in the evening and continued to drink at work, so I know I had a lot of water this month! This week, I also started to add a teaspoon of Apple Cider Vinegar to my water. You can read about the health benefits of ACV here. -Get organized. Yes. I got my planner from an Etsy shop (link here) and I've been using it constantly. It's great to track my workouts, make meal plans, and keep track of upcoming events. I also use it to plan out blog posts, so now I don't have to worry about thinking up ideas on the fly! Hitting 6 out of my 8 goals isn't too bad! I want to switch things up a bit in April, so here are my goals. -Race the 5k and 10k. On this Saturday and next Saturday, I have races (5k this week, 5k with Dan + 10k alone next week) and I really want to race them to see what shape I'm in. I'm not sure what that means in terms of time, but I'm hoping to really push it. My A, B and C goals can be found here. -Try a new workout class. I love my current routine of classes, but I want to mix it up this month and test out one new class. I'm interested in trying out kick boxing or Group Active, so we'll see which one I get to do! -Read two books. Upping the ante this month! I'm already reading Paper Towns by John Green and Runner's World Big Book of Marathon Training, so I'm sure this will be no problem. -Cook a different cuisine. This month's plan is French, which should be fun. I honestly haven't tried very many French foods, so this could be interesting! -Go to church. I've been really lazy lately and haven't been to church in an embarrassingly long time. Ever since I moved I find excuses to not go, so I need to start attending again! It's horrible! I'm linking up with Jill for her Friday Fitness Linkup! What goals do you have this month? Any races coming up in April? If you want book ideas, I've got them. I read so much, but I bought a very long book last month and I'm still reading it. I've already got my next 2/3 picked out. You've got some really good goals for March! I just set up my goals for the year (i'm a little late) but it's really inspiring to follow along with ladies striving to be better. Best of luck to you this month, you can do it! Thank you Carissa! It's never too late to set up goals for yourself! It's great you didn't wait until January to make changes in your life. Good for you! Thanks for the encouragement- I think I'll need it :) Hope you achieve all your goals too! I also love setting monthly goals. This is the first year I've done, and I think it's keeping me much more accountable. You did awesome on your goals! I have been wanting to read something *not* related to running since that's all I usually read, so I'll have to check out that book! Nice work this month. My main goal this month is to take care of myself and avoid injury and illness. I'm also with Jennifer - I really need to read something non-running related. I'm literally sitting here right now with Pfitzinger's Advanced Marathoning in my lap (as if reading it for the millionth time will make something change and freak me out), and beside me sits Daniels Running Formula atop of a stack of Runners World magazines. I've got problems. Oh, and I wanted to say I really like the new template! It's pretty! I had to refresh my screen a couple times because I thought my computer was being wonky, then I actually took the time to read you changed it... haha. Thank you so much! Sorry for the confusion lol I should have a disclaimer or something! I love looking back and reviewing progress with goals. For the first time ever I'm trying a no goals approach to April. We'll see how it goes. Have an awesome weekend and thanks for linking up with Fitness Friday!